Martins show came highly recommended but exceeded all expectations - funny, intellectually engaging, expertly pitched and quite extraordinary in demonstrating the power of suggestion. As a send-off on their last school day before Study Leave and exams, it gave our Upper Sixth a much needed chance to forget their stress and bond as a group again. The students were fascinated, leapt at the chance to be involved and enjoyed themselves enormously. I have invited Martin Taylor to lecture every year for the past fifteen years, and I shall continue to do so as long as I am in charge of General Studies. His demonstration is unquestionably the most instructive, the most professional, and yes, the most unashamedly entertaining lecture of the year. In my experience you are peerless on the General Studies circuit. The balance between education and entertainment was superb and some of the hypnotism stunts were jaw-droppingly good. The boys simply loved it! ...the best and most impressive display of its kind that I have ever seen. ...amazing, informative and very entertaining. 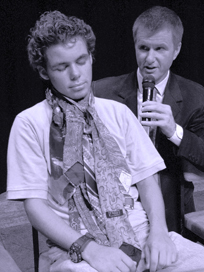 Martin has performed for my sixth form on nine occasions: every year he is invited back by the students to give his unique blend of education and entertainment. He first explains his profession in astonishingly open terms, but having stripped away much of the false mystique, proceeds to elicit amazing reactions from his volunteers and send the audience into hysterics. This is a show that must not be missed. I just wanted to say that your show today was phenomenal. i couldn't believe the way Adil reacted to your shoulder tap. I can honestly and correctly say that you stunned all the audience as well as captivating them all. Well done and thank you for that great show. Both impressive and memorable, Martins ability to gain the confidence and support of his audience from the very first word he uttered spoke volumes about his experience; his explanation of the psychology of suggestion was educational, and his practical demonstrations were massively entertaining. Highly recommended. You were every bit as good as your billing and the plaudits that preceded you! Enthralling! It was obvious how much the boys enjoyed it, and many of them have told me individually how stimulating they found it. I will most certainly be in touch when we are on to our next cycle of VI Formers. Martin has everyone, audience and volunteers alike, eating out of the palm of his hand. ... One of the best evenings of the year, greatly anticipated and hugely enjoyed. There is no doubt in anyones mind that it was the best Science Society lecture there has ever been here. It is still the number one topic of conversation here and will be for a long while to come.